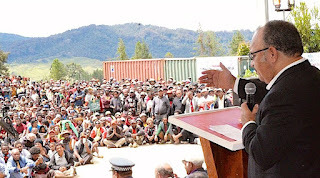 The People’s National Congress Party has hosted two of its biggest political rallies in the Southern Highlands Province. Party leader and Prime Minister Peter O’Neill told the thousands who gathered in Nipa in the Nipa-Kutubu District and Pangia in his home electorate of Ialibu Pangia that he's more than confident of returning to Parliament and leading the next government as the Prime Minister with their support. Mr O’Neill also revealed his PNC candidates who will be carrying the party’s flag in Enga, Hela and Southern Highlands provinces. With two Supreme Court rulings declining to recognise his government when it first took power in 2011, a stream of votes of no confidence and the continuos political cloud over his rule, Peter O’Neill told the thousands who had gathered that this term of Parliament was not easy for the PNC. However he’s more than confident of returning to power. "Don't think another man will come and form government, we will form government,” Mr. O’Neill said. Party member and Moresby North West MP Michael Malabag also boasts of the party continuing its rule. “We are together in solidarity,” Mr Malabag said. The man now acclaimed as the father of free education, continued the campaign momentum in Pangia on Friday when he nominated to defend the seat he’s occupying. Mr O’Neill also revealed a total 16 candidates who will be racing under the PNC banner in Enga, Hela and Southern Highlands, beginning with Sir Peter Ipatas, a man who has served the longest in a governor’s post in Enga. In Hela, PNC endorsed Tari Pori MP James Marape, Koroba Lake Kopiago MP Philip Undialu who will run for the Regional Seat, Edward Arina for Komo Magarima and Isaac Matiabe for Koroba Lake Kopiago. In Southern Highlands, PNC has endorsed Governor William Powi who will re-contest the Regional Seat, Nipa Kutubu MP Pesab Jeffrey Komal, Kagua Erave MP James Lagea, Mendi MP De Kewanu, and Imbonggu MP Francis Awesa.